WHAT A LIFE! Own a GRAND HOME of over 4000sf. with your own hobby farm or lease out the acreage and just enjoy this comfortable spacious home featuring 5 bedrooms, 3 bathrooms with extras galore. Cork flooring throughout, laundry/mud room, pantry, wood frame windows and doors, water softener, reverse osmosis, vacuum built in and underground irrigation. 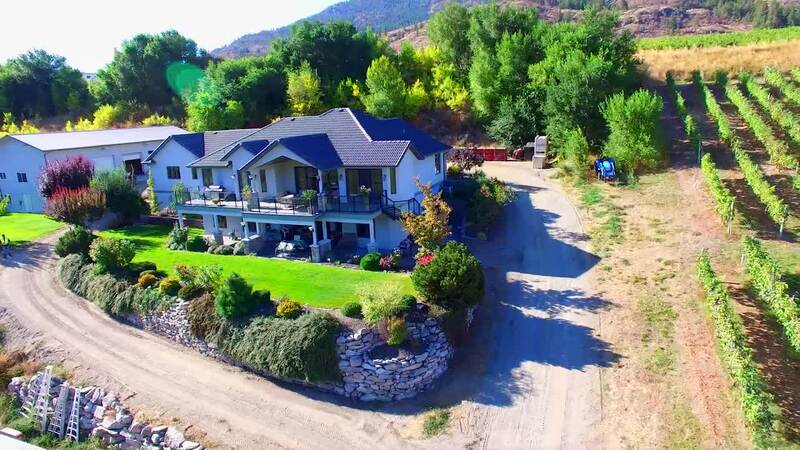 Walk out the huge double doors to the main floor deck to enjoy the stunning orchard and vineyard views or relax on the full, house length patio on the lower floor. The basement features a full kitchen, dining room, family room, 2 bedrooms, a weight room & a wine making room. There is an outbuilding which holds a great 1 bedroom guest suite and 2 large storage rooms .Lots of parking room for the RV/TRAILER or BOAT ETC. Tons of storage and a huge double garage. All this and grape vines for the wine connoisseur. Call for an appointment! All measurements approximate, Buyer to verify. The blue circle drawn on the map represents the area which is most likely to contain listings comparable to 14014 Hwy 97. If you wish, you may adjust the circle by dragging the white center handle to move it, or dragging one of its other white handles to resize it. Press the 'Next' button at the top when finished.